Palms, palms and more palms. 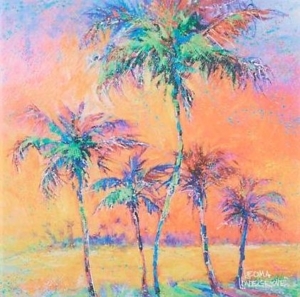 It seems that palm trees are in the news this week! 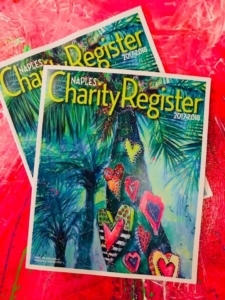 Yesterday, I announced that my painting Hearts of Palm won a competition sponsored by Naples Illustrated and is now on the cover of the 2017-2018 edition of the Naples Charity Register. 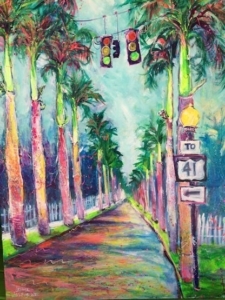 Tomorrow, a photography exhibition titled City of Palms opens at the Sidney & Berne Davis Art Center. All this attention on palms is only natural living in a place like Southwest Florida. In case you don’t know the story of how Fort Myers got the nickname of “City of Palms,” it dates back to a nurseryman by the name of James E. Hendry, who suggested the appellation nearly 100 years ago. It stuck. But there’s more to the story, which started back in 1897. That’s when a big-time merchant from New York City decided to build a tourist hotel on the river on the eastern edge of the business district. He called his establishment the Fort Myers Hotel. But on the advice of his gardener, O’Neill planted dozens of royal palms on the grounds. They grew so rapidly, that the grandiose palms quickly became the talk of the town. A consummate marketer, O’Neill quickly changed the name of his hotel to the Royal Palm and advertised both his hostel and the trees in newspapers throughout the northeast. Tourists flocked to the little cow town on the Caloosahatchee, where you could catch tarpon from the docks. Thomas Edison wasn’t a tourist. He’d bought land and built a winter residence and botanical lab and gardens as far back as 1886. That was the year he married Mina Miller, and a couple of years later, they started a family of their own. At that time, the only way to get to Fort Myers from Edison’s home in South Orange, New Jersey was to take a train south to Cedar Key, board a schooner to Punta Rassa and then wait for a steamboat to take you upriver. It was a taxing trip for adults. It was out of the question for a couple with three minor children. 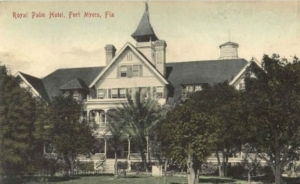 And while there may have been other factors to explain their 14-year absence from Fort Myers, that’s the principal reason that Thomas and Mina Edison didn’t visit Fort Myers or their beautiful winter home between 1887 and 1901. When he returned in 1901, the royal palms at Hugh O’Neill’s hotel were firmly established and the electrical wizard became an ardent admirer. So much so that he offered to plant the palms along Riverside Drive (which is what McGregor was named prior to 1915) from Monroe to Manuel’s Branch if the city would agree to maintain them. I t turned out that it wasn’t as easy as Edison imagined. The first 1,100 royal palms that Edison purchased died when their importation from Cuba was blocked by a quarantine following an outbreak of yellow fever on the island. Through his agents, Edison found 700 in the Big Cypress, but they died too. He was finally able to import 1,300 trees from Cuba, but the city didn’t hold up its end of the bargain, and many of these trees eventually died too. That’s when James E. Hendry, Jr. got involved, along with Edward L. Evans and William Jeffcoat. Edison donated 178 more trees, and the city appointed the three men to its first ever park commission. I’m glad they stuck it out because today Fort Myers is known worldwide for its royal and coconut palms. They’re not only a favorite among the people who live here, visitors like them equally as well. 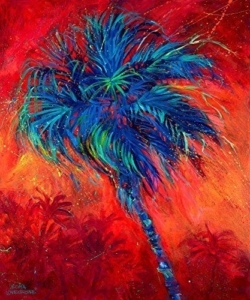 Paintings and prints of our palm trees and palm fronds are favored by out-of-towners who visit Lovegrove Gallery & Gardens, as are the painted coconuts we make and sell in the gallery. 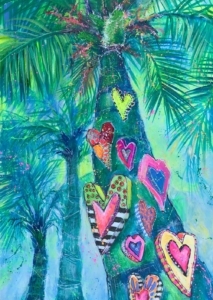 And now you can get limited edition prints of Hearts of Palm, which graces the cover of the 2017-2018 Naples Charity Register. Check out both the next time you come to Matlacha Island.